from IHS Screen Digest, click here! The TV industry is drinking in every drop of data on changing audience habits that it can, so what better way to kick off this year’s MIPTV than with a stat-packed presentation from IHS Screen Digest’s senior principal analyst on TV and broadcast technology, Tom Morrod? He kicked off by noting that the consumer electronic device market is changing fast. 2008 was the first year when sales of consumer electronics devices – smartphones, tablets, games consoles, connected Blu-ray players and so on – overtook sales of non-connectable TV sets. 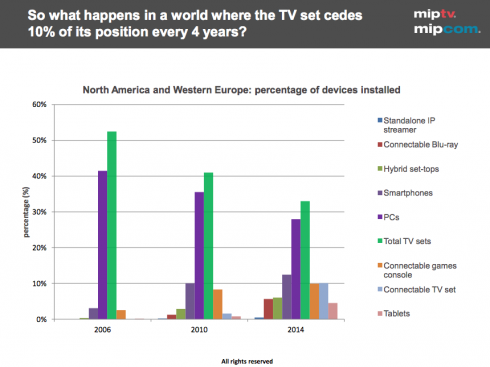 There are around 2.5 TVs per household in North America and Europe – a figure that won’t grow much in the coming years – but by 2014 there will be four devices per home that are neither TVs nor PCs: namely tablets, smartphones, games consoles and others. And these device types provide an access point into the home for content. “Depending on who you are within that supply chain… you have a different consumer control,” said Morrod, who also noted that pay TV operators are starting to embrace the idea of multi-screen TV, particularly when it comes to distributing TV channels for Android and iOS smartphones and tablets. “But there is no new money, it’s all about audience retention,” said Morrod. Pay TV subscribers aren’t paying extra for this multiscreen access, in other words. He went on to talk about what Microsoft, Apple and Sony have been doing, building their own content ecosystems around the devices that they sell. Apple has iTunes, Microsoft has Xbox Live and Sony has its PlayStation Network. Morrod talked about rising online video revenues. “Most of the movie revenue is driven by those ecosystems – those consumer electronics-owned ecosystems. They’re very good at controlling transactional behaviour for movies.” By contrast, advertising revenues around online video is still going more to the likes of ITV, ABC and HBO, through their online services. “This online video is really a tiny piece of consumer media spending,” noted Morrod, who added that online video traffic is still very expensive in terms of the traffic and created: the question being who and how is going to pay for this.